Fast Companies blog says: C is not only for Cookie (as in Cookie monster teaching children about literacy); the tradition of girl scouts selling cookies teaches them very valuable business, financial and economic literacy lessons. "Through cookie activities, girls learn how to plan, build teams, speak up, make decisions, solve problems and manage resources. These skills add up, so that ultimately, girls learn to be leaders--in their own lives--and in our communities,"
Still enjoying "The Knowing-Doing Gap " and found very strong links between "First, break all the rules" by the Gallup organisation and the two publications by writers Pfeffer and Sutton (this one and Hard Facts...). Main 'link' (at the moment) is concentrating on what you expect the end-result of any task to be (any task for any employee/supplier - even yourself), not on the precise steps to get there. I also find strong links between this and "Good to Great", another of what I call foundation block, links to their 'Hedge-hog concept'. (Realise I should write a better review on Good to Great, I'll do that after I've finish reading this great foundation block "The Knowing-Doing Gap"). Last week Dawud at HealthyWebdesign started two interesting conversations on almost the same subject: "5 things marketing gurus need to learn from bloggers" and "Who else wants to be an Expert?" or why does it seem that only marketing gurus or someone who calls him/herself an expert are believed to know what to do, how to solve all business problems. It might be a coincidence, but at the moment I'm reading "The Knowing-Doing Gap " by Jeffrey Pfeffer and Robert I Sutton, the authors of: "Hard Facts, Dangerous Half-Truths and Total Nonsense" (See my review here). The subtitle is "How Smart Companies Turn Knowledge into Action". "Talking smart and being smart are far from perfectly correlated"
"..not only does this [a consultant advising a plant manager 'earns' twice as much as plant manager] pose an interesting career choice, it sends a message about the value the economy places on being able to actually run something compared with being able to talk about running something." I am enjoying this book tremendously and once finished I will write my 'normal' review as soon as possible. Some shareware I also consider as a freebie, when a small donation is asked for to remove ads etc from the software or as 'donation for the trouble the software developer put in the program. If the program works properly and adds something to 'ease' my work/function/task then I'm almost always more than willing to donate the small sum asked for. Not all Freebies are worth to have, free or not; if they don't work properly, are difficult to understand or to implement, or have too many bugs in it those programs get deleted from my computer straight away. I use this when working on certain Projects, it has a 'stop-watch' facility that lets you log real-time hours while working on a specific project, there is a variety in 'stem-items' to differentiate between customers, projects, tasks, employees, activities etc. And also very important: with the report function you can create time-statements per any of (or any combination of) the stem items. Very useful when you need to included a statement with an invoice (you can even set a price per unit and let the program work-out the total value of your invoice). Every month I create our Wood You Like Newsletter with this program. It 'writes' like a normal document but in the background lots of HTML functionalities can be used (links to webpages, adding pictures etc). The free edition allows you to store 100 emails per group. Since we have over 450 newsletter readers I have create 5 groups for this, no problem what so ever. The program send the mail out using your own standard SMTP server, you can choose which 'reply'-address shows on the email. Every reader receives our newsletter as send 'personal' only to them, so no long lists of other readers in the header. This PDF creating program comes with ads every time you use it, but for a tiny donation this is removed completely from the software. It creates PDF files, combines various documents into one PDF file, specific weblinks can be added (pdfEdit995) and even bookmarks can be made. A real difference when you're used to creating PDF's as a 'print-file'. 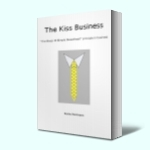 All our down-loadable leaflets are created this way, our booklet "Benefits and Advantages of Natural Wooden Flooring" is created this way and also (of course) my 'E-book' version of "The Kiss Business". Works a treat! Especially with the added buttons in MsOffice Word, all it takes is one click. Then of course I work with Eudora for my emails, use Post-it notes- Lite (embedded on my desktop, not plastered on the screen) and Spybot "Search and Destroy" to get rid of 'nasty' bugs and spyware. Why, if it is called the World-Wide-web, do so many websites, blogs, forums etc make it so difficult for the world-wide-visitor to find out (simply and almost instantly) where the company/business/organisation is based? Kent Blumberg suggested I'd read "Now, Discover your Strengths " (How to develop your talents and those of the people you manage), another publication by The Gallup Organisation (Kent is turning into my 'personal' librarian it seems). He also wrote a synopsis on the book himself, which is great to read (and do follow up on the suggestions Kent makes). It was no surprise for me to find the log-in code for the StrengthFinder online test. However, the findings/result from the test startled me pretty much. But back to the book itself. In fact it continues on one of the questions asked in "First, break all the rules" - do I have the opportunity to do what I do best every day? But what do you do best? Do you know what your strength is? What is a strength? A talent? An ability? Something you can rely on you have, portrait? I quote Buckingham and Clifton "An ability is a strength only if you can fathom yourself doing it repeatedly, happily and successful". As in "First..." the writers state that companies/organisations manage people better when focusing on talents/strengths instead of 'fixing' the 'weakness-gap'. In this book they urge you should "Capitalise on your strengths and manage 'around' you weaknesses". This is a concept easy to grasp, but (seemingly) hard to apply, because most managements believe the 'half-truth' that fixing the weaknesses will make someone better in/for his job. I found it a very interesting, even intriguing book to read. A real stop/start. And during some stops I realised that we don't change (i.e. our talents/strengths don't change), our knowledge about them, our awareness of them, changes. My recommendation: buy the book, do the test and then read the book (further, the StrengthFinder test is introduced in chapter 3). First for 'self-development', then read it again as a managing tool. The need to revamp Customer Service? Seth Godin states that customer service is broken. He is proposing a solution, but hopes you bear with him for more paragraphs. Well, I almost didn't after reading his three observations on why Customer Service is broken. The availability of blogs and other public histories means that it is harder than ever to treat different customers differently, words get out. First thought I had: no sorry, don't agree with that, we encounter many, many businesses who have excellent customer service. So excellent service that we don't mind we have to wait more than a day for the correct product arrives. And we are more than willing to pay the correct price for the correct quality of product/service (it pays in the end). And it does work to treat every individual as individual, only one word will get out: proper 'wrapped' service. Given the choice between amazing, guaranteed service with a one day wait or interminable waits on hold with people who can't really help you right now... well, the choice is pretty easy. Make sure your staff is trained to deal with enquiries, complaints etc efficiency. Main item Seth forgets: make quality your passion. Quality in products, quality in service, quality in recruiting quality personnel, quality in everything. Be so passionated about it that your customers become passionate about you. It works Seth; it works for us and for most of our suppliers. Is “The Power of Positive Thinking in Business” really a business book? Reading it last week I thought: hmm, not exactly. Scott Ventrella’s book is more a straight-forward ‘synopses’ of Norman Vincent Peale’s book “The Power of Thinking Positive” ; adding the words "in business" doesn’t really make it ‘special’. Is it a waste of time to read? No, not at all. I read Norman Peale’s book (voluminous book - 320 pages) 15 – 20 years ago and think that Ventrella (who wrote his book in cooperation with the Peale Centre) has managed to highlight and ‘contract’ the essence of the whole concept of Positive Thinking, worthwhile in any situation or any circumstances; not just in business. The reader is encouraged to take the “Positive Thinking Inventory’ test (50 statements you have to rate 1 to 5 in relation to how many times you engage in that specific thought, feeling or action) and work out which of the ten traits of Positive Thinking score high and which score low. The ten traits are: Patience, Calmness (Holding Power), Belief, Integrity, Focus (Centering Power), Optimism, Enthusiasm (Uplifting Power) Courage, Confidence, Determination (Driving Power). Not really a surprise to me, but my lowest score was Patience. I am determent, I have optimism and focus, but patience? Not my strongest point I’m afraid, especially when ‘waiting’ for a reply, an answer, a decision from someone else. These two ‘handles’ will be on my mind now and as I’ve learned before: becoming aware of something is half the battle won. The book ends with a worksheet to make it easier to put everything read, learned and acknowledged from the book in to practice. A good idea worth following (and I do have a particular project in mind I’m sure this worksheets comes in handy). Flexible employee or flexible employer? Where would you rather be: working for a company that allows flexible working (favoured by The Chartered Institute of Personnel and Development – CIPD), or for a company that feels that having flexible working stands in the way of ‘getting the job done’ (commented by Confederation of British Industry – CBI)? IMHO flexible working, implemented the correct way, creates a better atmosphere to ‘get the job’ done. Valentines Day, how appropriate a theme to tell all members about what you love most in - of - from - by you company. Jamie O'Connell of Credit Control Solutions Ltd got everyone involved this morning by first telling us about what he loved so much about most companies gathered around the breakfast table that he didn't want to do what they did, because all were better at it than he is. Like he didn't want to do his own accounts, he leaves that in full faith to the accountant present. Then, and that won him the weekly trophy, Jamie got everyone chanting: "I wouldn't want to do my own credit control, I leave that to Credit Control Solutions". Involvement during the short spot you have during the 60 seconds comes very close to adding the WOW-factor described by Ron W in his comment on Kent Blumbergs post: "How to prepare and deliver a great speech"